Limitless desserts, drinks that taste like pure candy and the lure of a lazy day at the pool. Ahhhh. From the big indulgences can come big consequences when it comes to fitness. I recently navigated my way through my first cruise and had to put my own fitness advice to the test as I wound my way from Long Beach, CA to Ensenada, Mexico in a boat fully-equipped with a 24-hour food opportunity and an easily-forgotten gym nestled on the top floor. On this trip I learned, sometimes it is just about minimizing the damage. I’d never suggest that you go on a vacation and not indulge in the luxury being offered to you. However, if we give ourselves a “pass” to not take care of our fitness every time we have a special event, the damage will truly add up. 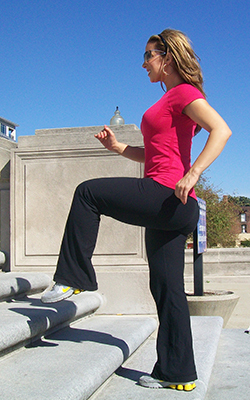 Just like it is the tiny positive choices that build up to create success in fitness, the small backward steps can set you back enough to truly discourage your efforts. To my surprise, as I made my way up to the gym to “limit the damage” from the night before, I realized how many people had the same idea. Early Saturday morning, dozens of people were there at the gym-at-sea, weights in hand and braving the bobbing treadmills as the boat sailed toward Ensenada. I don’t think anyone was looking to make a serious life change, drop pounds of fat or gain pounds of muscle. They were likely just trying to stay on track while away, so they could easily transition back into their regimen when they return. Since exercise is proven to increase energy levels, endorphins and blood flow to the brain, wouldn’t you want that extra boost during a special event so you can make the most of your adventure and have energy? Even though you can’t out-train a dirty diet, the exercise can certainly give you a good chance to refresh your body and gets the blood flowing. Either allow yourself to do an exercise that you enjoy that isn’t necessarily as intense as what you’d normally do, for a longer period of time. For example, if you normally run for 30 minutes a day, go on an hour-long leisurely hike. Or, if you usually sweat it out in a 60-minute spin class, rent a bike and cruise outside for a couple of hours. Or, do the workout quickie, which is a short and sweet plan to get an intense workout and then get out to enjoy your vacation. See below. THE VACATION WORKOUT QUICKIE. You need a generic hotel gym with minimal equipment. Just a treadmill (or any workout machine) and hand weights. Warm up: 5 minutes walking or jogging on the treadmill to a pace that gets you sweating. Cardio: 5 minutes walking or jogging on the treadmill as fast as you can. Lower body: 15 lunges per leg while holding a dumbbell that is as heavy as you can handle. Upper body: 15 overhead shoulder presses with the heaviest dumbbells you can handle. Lower body: 15 squats with the heaviest weight you can handle. Upper body: 15 triceps dips either on a machine or on a flat bench with weights resting on your legs. Lower body: 15 hamstring curls on a machine or with an exercise ball. Cool down: 5 minutes walking on the treadmill. There you go. 30 minutes of cardio and just a touch of strength training to get out of the gym ASAP and enjoy your trip! ***Always consult a physician before beginning any new workout program.